This commissioned sail consist of the ChallengeMax Poly (Navy) with Silver and Sky Blue Icarex. A bit of a different look combo than I typically do but the combinations work in the colorizer so it should work in mockup.. More to come in a bit.. I don't do roll ups, but yet needed to add (rip stop) tape to hold them. Much differently, but wouldn't like to be without either one. 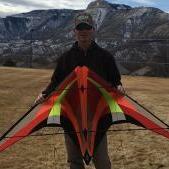 The Kymera is a great and trickable flyer with a large wind window. The Hydra got a smaller wind window. Little input is required to make it do much trickwise. Pitch sensitive as well - won't get stuck in a turtle. For a beginner the Kymera would be easier to understand. In case I'd be out on an initially low wind day starting with the HQ Shadow, I could then go on with the ITW Kymera, then the ITW Hydra, then HQ Infinity (then a vented QLK). I think he's urging Breezin to learn quad-line. from tension on the lines and leading edge of kite facing up-right,...... thumbs up, step back, lower your hands, hold the handles softer and closer together too. Relax, this is fun, breath, learn the cartwheel technique first so you can roll-over from inverted. only four moves are possible,.. 1 both thumbs @ nose= forward (NOT up), 2 both thumbs @kite=reverse (NOT down) 3, one thumb @nose =clockwise rotation (not a left turn!) 4, other thumb @nose=counter-clockwise rotation (not right turn) So the kite doesn't go up and down, and it can't go left or right, the controls are minor influence to major impact at the kite. Try softer,... and add in some body position movements and your feet don't have to be stationary either! you'll love the quads because they can fly anywhere anytime any conditions,... you just gotta want it bad enough! Maybe to the night-fly April, .....We will be there Wednesday, not in the condo either (so less crap to lug!). What time are the kids down? I could probably be convinced btw 8:00 pm-10:00 if I have an afternoon nap first. 3rd street & boardwalk I think? (Barbara handles those lodging details). Paul Dugard and I will both be there Thursday whenever, if you can join us 243 kiters signed on/up so crowds will be treated to a great show see ya there! I hear you. My first ever outing with a dual-line kite (a brand-new Quantum) I hit the beach in a hard nose dive and broke the center T. Was surprised how easy it was to repair and after that haven't feared busting anything. I try to take good care of them, but don't mind them looking loved.